Having completed a recent digital mapping exercise in CHI, maps and digitization has been a part of my daily thought process for several weeks now. As a kid, I always loved maps. I would stare at them and dream about all the places I wanted to go and the adventures I would have. An entire wall of my bedroom was a large map of the United States, by large I mean at least 6’ x 5’, from the Air Force. It was so fun to stand on my bed and read the names of cities all over the country and see where Air Force bases were located. As an adult, whenever I travel to a new country, a map is the first thing I order to take with me or buy when I land. I have a collection of atlases and maps from everywhere I have traveled, including historic maps of some foreign countries I have been too. My office walls are full of antique map and globes. I even enjoy maps from places that are not real. For our mapping project, we did the land of Middle Earth and mapped the journey of Frodo and Bilbo, overlapping various points throughout the stories where they intersect. This lead to me thinking about other kinds of maps I use. Being an avid gamer, one of the most important features of any game, is the map. Any massive multiplayer online role-playing game (MMORPG) requires the use of a map, that’s why it is so important to explore the realms and reveal the map on any game. Even on racing games, a map is essential. The evolution of landscapes, both digital and real are fascinating to look at through topography and cartography. If anyone has ever seen a map of Michigan from the 1600’s, you find it looks like a weird, triangular piece of earth, jutting into the lake. Click here for more information about this map. This looks nothing like the beautiful mitten we all know and love today (unless you’re from Wisconsin maybe). 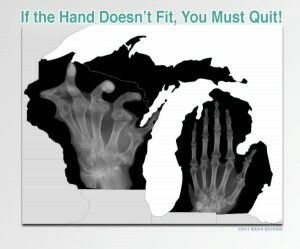 Click here to learn more about the real mitten state. Our sense of self-identity is tied to maps and the landscapes we consider home. What do you say when someone asks, ‘Where are you from?’ What image does this question bring to mind? Now this brings me to something I am excited about. At BlizzCon recently, the new World of Warcraft expansion was announced, complete with trailers and new maps. Much like our own cartography, the maps of our MMORPG’s change and evolve with new continents being discovered. This expansion shows to be no different (Expansion News). 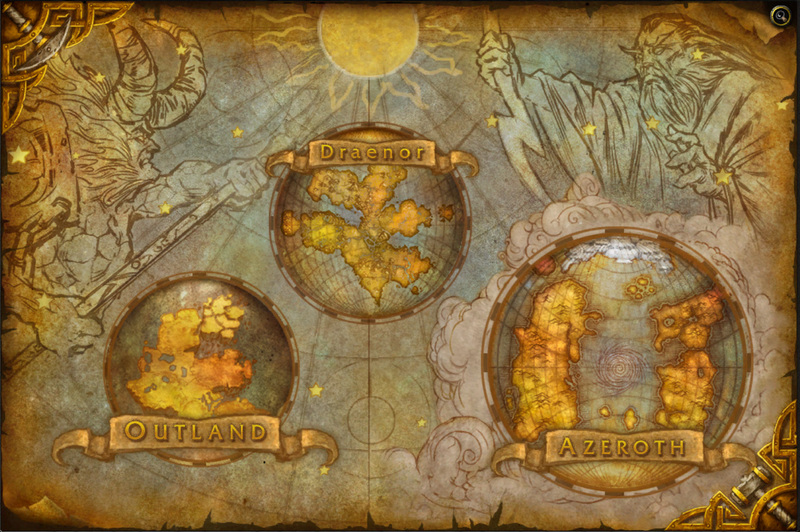 Those of us that have played WoW since it’s early beta days in 2003, know all too well the familiar terrains of Azeroth and are only too excited to explore the new lands opened with each expansion. As a player, you become familiar with the capital cities, the paths there and the various terrains and animals encountered in each. We know intimately the homeland of our chosen race and the home continent of our allegiance, be it Horde or Alliance, much as we know the familiar stomping grounds of our physical homelands. These digital landscapes change as much as our own physical ones through time. 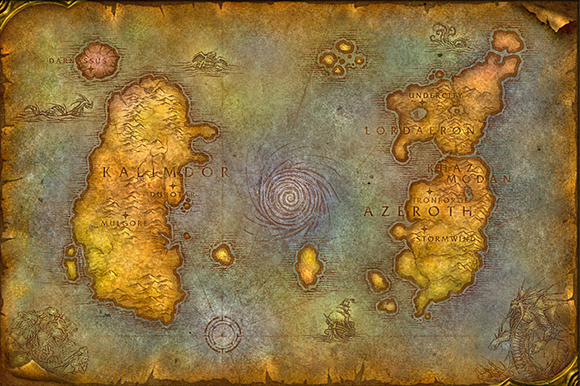 Compare Azeroth here at the origin of WoW, in the days of old when we could only travel via foot, flight path or boat. Here you see the map as it looks now, six expansions later. As the game has evolved over time, new continents have been revealed along with new races on these inhabited lands, much like the coast of Michigan. This entire train of consciousness has been brought on because the Thanksgiving holiday is quickly approaching, and I hope to have time to flee back into my favorite digital and/or physical glades be they in the eastern Kingdoms, Kalimdor, the Upper Peninsula or somewhere new. The landscapes we inhabit are our home. We become used to them as we travel the slopes and explore the depths of the worlds around us and sometimes fail to notice the small changes that take place until we are away for a significant time. Over the U.S. holiday, take the time to enjoy your homelands and their associated families, both digital and physical. Notice the landscape both beneath your fingers and feet and appreciate their beauty. Happy Thanksgiving!